After a marathon session of cookingeating yesterday and a bit of computer issues as well (it looks as if my laptop is in need of a part or two), I am finally back up and running! With that said, I hope everyone had a very Happy Thanksgiving, a fun and productive Black Friday, and that your pants aren’t too tight come Monday morning. I’ll be back on Monday with some (hopefully) completed projects to share and LOTS of links to make up for the lack of Linky Thursday this week. This entry was posted in General on November 28, 2014 by stacy. I will shamefully admit that today’s post was delayed by a bit of online shopping and some dabbling in the kitchen for pre-Thanksgiving preparations. Speaking of dabbling in the kitchen… I whipped up my last (yes, I’m serious this time) gift for my Stocking Swap partner…. 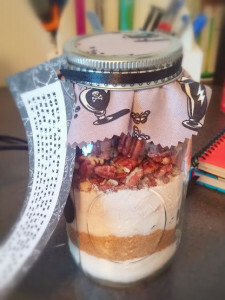 a Harry Potter themed Butterbeer Cookie Mix. This was something she had on her Pinterest and it sounded yummy (it’s got to be good, it has butterscotch pudding in the mix) so I went for it. I was missing some of my cute paper labels that I used for last year’s jarred cookie mixes so I was left with a removable chalkboard style which looks, ‘meh’ (although I think the Tula Pink Apothecary Jar fabric on the top ties in well to the theme). Now all that’s left to do is wrap and send out…. and of course partake in lots of baking today. What is everyone else up to today? This entry was posted in General on November 26, 2014 by stacy. 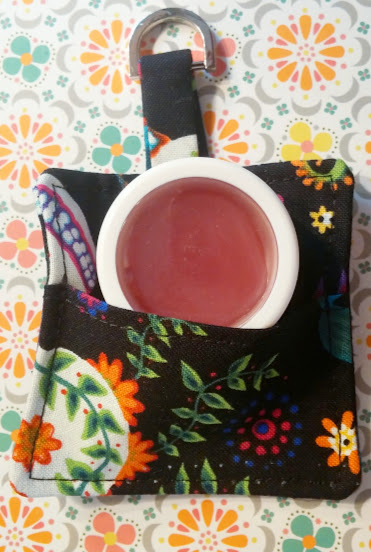 If you’re ever looking for a quick little stocking stuffer to make, these Kool-aid Lip Balms are the way to go (plus they smell really good too)! One one thing about them, though, is that they kind of look sort of plainlost when you set them next to the other goodies that might be in your stocking…. so, I made it a ‘cozy’. Yes, I know I said that I was almost done with my Stocking Swap partner’s package, but I really couldn’t resist making this item a bit more fun. I’m sure there is a tutorial out there for something similar, but, once again, I just ‘winged’ this one. I constructed it very similarly to the Pocket Tissue Cozy instructions floating around on the internet except I added a tiny D-ring (so you an attach it to a key chain if desired and my ‘flaps’ overlap some so that the little pot doesn’t fall out when you carry it around (I would also like to add that it is square when flat, but when you put the container inside, it will distort out of shape, I made it pretty snug). I have one last (yes, I mean it this time!) item to put together and then I’ll start wrapping everything up…. then it’s time to move onto Christmas gifts for friends and family! This entry was posted in General on November 25, 2014 by stacy. As I was putting some ‘finishing touches’ to my Stocking Swap partner’s package, I decided that it was looking a little puny. While I’m trying very hard to keep it ‘medium’ sized (I have a tendency to go way overboard), I still thought it looked like it was missing something. So, I went back to her Pinterest board and found more inspiration. That’s when I decided to make a not so discrete feminine product pouch. I totally winged this – meaning I really didn’t think it through as to how I was going to construct this pouch…. Consequently, if I had to do it over again, I’m pretty sure that I would sew it differently (I made it much harder than what it needed to be, IMHO). 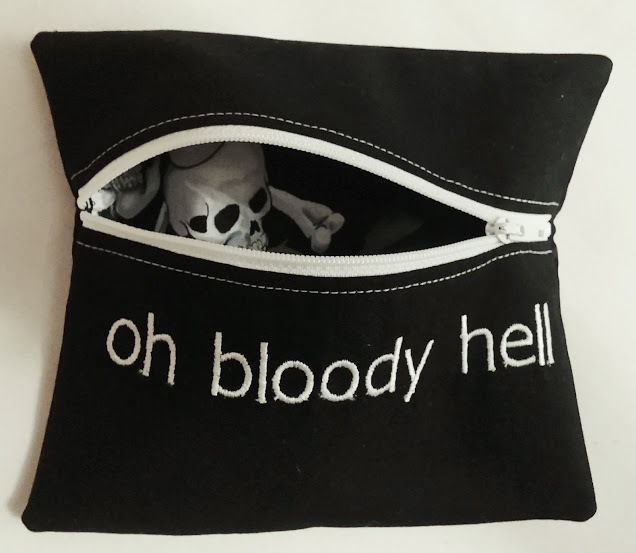 With that said, it’s a pretty fun bag – I had a chance to use the lettering on my embroidery machine and I like how the skull and crossbones peeks out when you unzip it. This entry was posted in General on November 24, 2014 by stacy. Getting ready for the holiday’s doesn’t always mean breaking out the ‘big Christmas tree’, sometimes less is better! 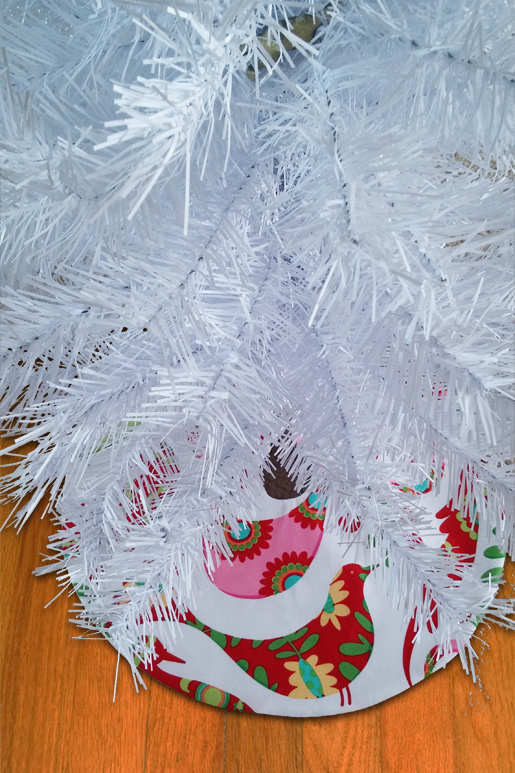 Dress up your tabletop or mini trees with a new skirt – my latest tutorial at WeAllSew. Not only is this quick to stitch up, but only uses a 1/2 yard of material. Plus, the possibilities to dress this project up with trims, embroidery, etc. is endless! You don’t’ have to stop at making these for Christmas either – there’s plenty of other holidays that use small trees and ornaments to decorate your home as well (HalloweenEl Dia de los Muertos, Valentine’s Day) and this skirt works perfectly for all of them, just change up your fabric to suit the occasion. This entry was posted in General on November 21, 2014 by stacy. Since we typically don’t dress up for the holiday, I sort of want to make Pilgram hats for everyone to wear at the table this Thanksgiving. Keep the kids busy this Thanksgiving by giving them their own feast to prepare. This adorable stuffed turkey should do the trick – although I’m thinking I would like to make it into a festive pincushion! A cute way to serve your meal this holiday: Turkey Potholders! Bringing libations to your holiday celebration? Dress it up by slipping it into a pretty (and quick to sew) wine bag. Upcycle a pair of women’s pants into a cute Booty Bag. The name alone makes me want to sew one up! Keep warm during the arctic freeze by making everyone these Homemade Hand Warmers. Looking to make a Christmas gift for the make-up lover? Try one of these awesome Cosmetic Pouches. Learn how you can turn your leggings pattern into jeggings. With all 50 states experiencing some sort of below freezing weather, chances are you’ll be lighting your fireplace soon. Bring in your logs with one of these handy firewood carriers. Tired of the same ‘ole colorblocking? This tee has a different take on it, and I love it! I’m all about the plaid lately, I think that’s why I love this quick and easy tartan infinity scarf. Look great in the kitchen while you prepare your Thanksgiving feast with a new flirty apron. Feeling festive? Have a cold? Whip up one of these Modern Holiday Tissue Box Covers and you’ve tackled both problems at once! I volunteer as tribute…. to wear one of these awesome “Mommy & Me” Hunger Games inspired tees! This entry was posted in General on November 20, 2014 by stacy. One purse that I’ve been wanting to make for quite some time is Emmaline Pattern’s Butterfly Sling – thanks to Pattern Parcel #7, I had the perfect excuse to finally make one! This cross-body style bag looks small on the outside, but stores lots of your essentials because of all the ‘hidden features’ – 2 deep pockets, plenty of card slots, and an ID holder on the inside of the bag for quick and easy access! 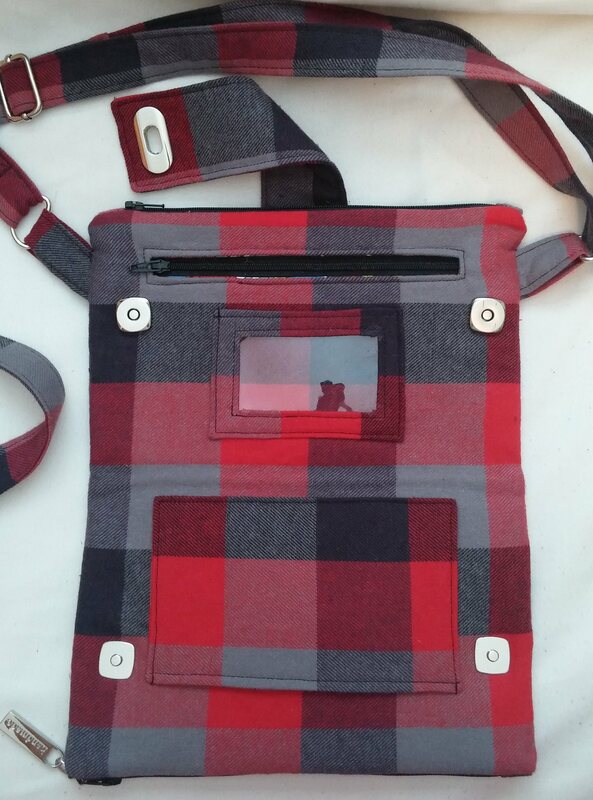 Plus you’ll never have to worry about your purse falling open while your wearing it because of the magnetic closures installed on the inside of the purse. 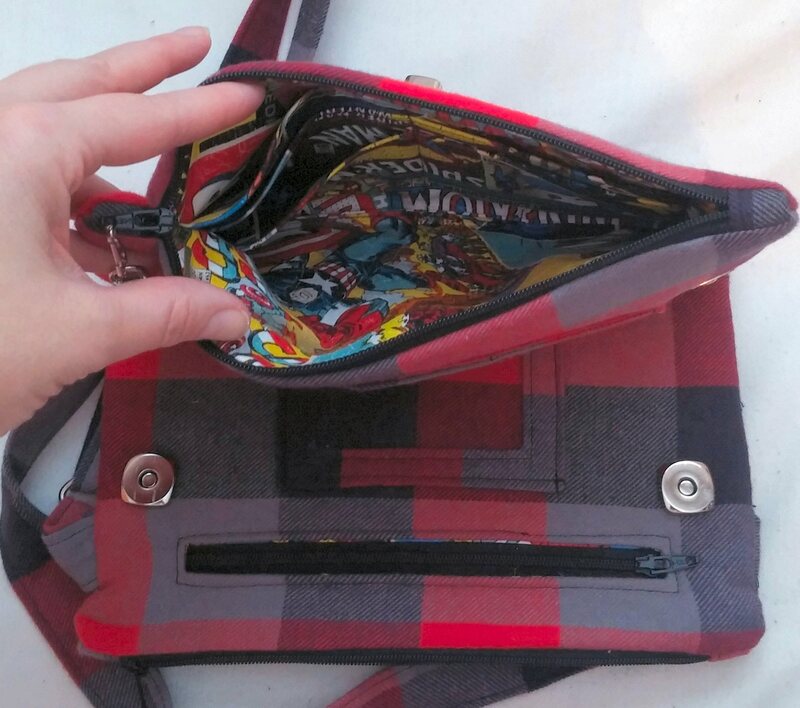 For my version, I used a buffalo plaid flannel for the exterior, a fun comic book print for the inside, and lots of hardware from the Emmaline shop (metal slider, purse lock, and even a great ‘Handmade’ zipper pull). Keep in mind that if you chose to use a flannel for any sort of bag (because I am thinking this would also look great as a Swoon Betty Bowler) that the material is not particularly stable. 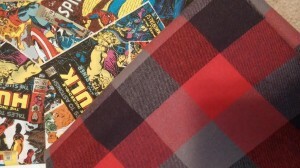 Even though there is plenty of interfacing used in this bag, it would be a good idea to use a lightweight fusible to keep your material from distorting while sewing…. in fact, it might even be a good idea to fuse it before cutting as I found that my fabric was horribly off-grain. Overall, this was a fun bag to stitch up – there were some techniques that were new to me so I learned a few things in the process as well. Plus I got to try my hand at installing a purse lock (I will admit, there was a bit of fear that came over me when I had to cut a hole into my ‘finished’ project, but everything turned out fabulously, without a hitch). 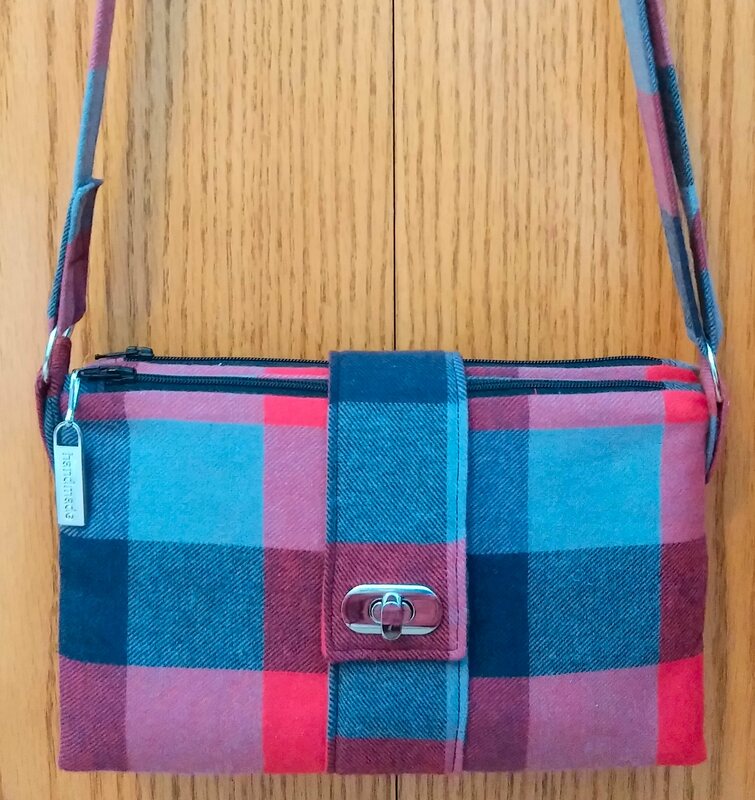 I think the finished look has a perfect fall feel (even though it feels more like winter around here right now) and is going to be so useful for holiday shopping (I like to wear crossbody style purses so that I never loose sight of my bag while in large crowds). I can definitively see stitching a few more of these up in the future (can you say new leather crossobody?)! Have you gotten your bundle yet? There’s only 2 days left to purchase yours and includes the Butterfly Sling as well as Swoon’s Betty Bowler, Betz White’s Midtown Messenger, ChrisW Design’s Evelyn Handbag, and Pat Bravo’s Barcelona Bag & Wallet. Plus when you set your price as $32 or greater you will automatically be sent the Daphne Bag by Clover & Violet as your bonus pattern! Want more inspiration as to how you can style your bags from this bundle? Be sure to check out the blog tour happening now! This entry was posted in General on November 19, 2014 by stacy. Aside from the pile of patterns that I have stacked on my cutting table, I can see all the surfaces of my sewing room…. now to just make a dent into all those patterns (and recently acquired fabric purchases). What’s next? Tomorrow I’ll reveal my version of the Butterfly Sling, but I’d love to squeeze in one more bag (Swoon’s Betty Bowler, both from the Perfect Pattern Parcel #7) before the week is out. This entry was posted in General on November 18, 2014 by stacy. November is halfway over and I have come to the realization that I will probably not accomplish all the handmade holiday sewing that I had hoped. Between my ‘prior (sewing) commitments’ and the fact my mom recently had surgery and requires more assistance from me, my productivity level is definitely at an all-time low. However, I can show you a sneak peek at one of my soon-to-be-released projects – I adore how this material worked with the finished design! Now it’s time to get my tush back into the sewing room – I’m feeling a strong urge to make a new long sleeved top to keep myself warm after our weekend snow! This entry was posted in General on November 17, 2014 by stacy. I am gearing up to make another bag from Perfect Pattern Parcel! This time around I’m giving the Butterfly Sling a try as I definitely could use a new purse for fallwinter and this pattern looks like it’s just my style. Although, I have a sneaking suspicion that when my daughter sees the finished purse, she’ll grab it! For my version, I settled on a flannel buffalo plaid for the exterior and a fun ‘comic’ print for the inside. I may play around with using a leather for the closure and cross body straps, but I am thinking I may like it more in an all around print. Look for the finished design on the blog this Wednesday! This entry was posted in General on November 14, 2014 by stacy.